Last weekend I made Strawberry Basil margaritas to enjoy before a concert. I love these margaritas because all the ingredients are natural, so of course, that helps them to be lower in calories than margaritas made with premixed sweet and sour. I always recommend getting an authentic, traditional margarita on the rocks because the sweet and sour at many places is filled with tons of artificial ingredients. Not to mention it usually has an excess of calories... up to 500 calories!! Yikes. This delicious little cocktail has around 150 calories--much better! 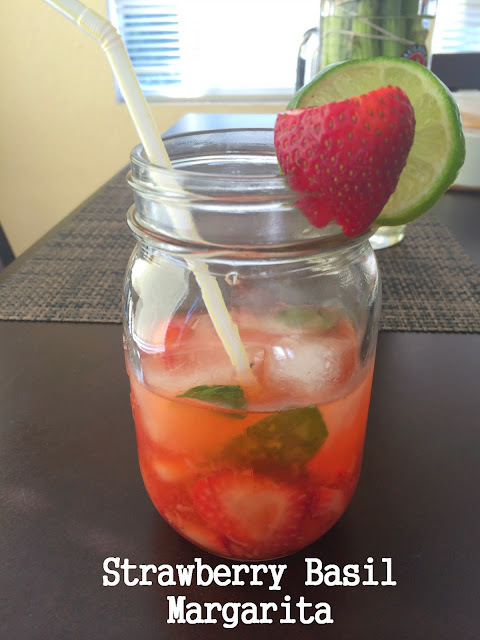 Using a shaker or two glasses, muddle the strawberries, basil, and agave nectar. Add ice, the lime juice (about 2 Tbsps), agave nectar, 1 shot of tequila and 1/4 to 1/2 cup of water. Shake with ice for about 10 seconds. Pour into a rocks glass or strain into a martini glass. Garnish with a strawberry, lime slice, and/or basil leaf. You may have to do some taste testing to see if you have the right sweet to sour consistency. This is dependent on how much tequila, lime juice, and agave nectar you use. If your limes are super juicy, you may want to add more agave. If you use a lot of tequila, you may need to add more water.